Granite has been around since the beginning of time and is ubiquitous on Earth. It can be found on nearly every continent. Here in New Hampshire the state is known as the “Granite State” for its concentration of the stone. Maybe that’s one reason why I like granite countertops so much. They are as “old school” and close to home as it comes when it comes to kitchen countertops. But besides their old world charm, granite countertops offer many functional and aesthetic advantages over all other kitchen countertop materials. Granite countertop colors for example range in the hundreds, with color shades varying from black, blue and green, to reds, browns and whites. Granite is also an extremely hard stone thus making it so durable. Only the diamond stone is harder, and both are formed from molten rock. Also, due to its variations in color and mineral veins that can run through it, granite has a stunning and beautiful look when it is cut and polished into a countertop slab. Granite countertop colors also help to add, elegance, character and warmth to kitchens, bathrooms, and any other room that employs countertops. Granite kitchen countertops have skyrocketed in popularity over the past couple of decades with kitchen designers and homeowners. Though expensive, the number of advantages associated with granite, including the various countertop color options that are offered with granite, have many homeowners willing to pay the price for it. 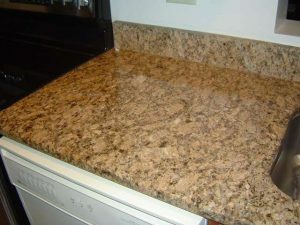 Beige/brownish color tones are the most popular granite countertop colors today. However, black and blue colors seem to be trending upwards in popularity with homeowners lately. To some extent it’s not surprising since the dark natural colors tend to complement many wood cabinet colors. Granite countertop colors can also include natural patterns or designs in them, again due to types and variations of mineral content in them. Some granite countertop colors can even appear to exhibit “movement” in the stone. As a result of the wide variations in colors and patterns it’s almost impossible to have two granite countertops that look alike. This is normally a good thing, unless you decide you want to include more granite countertops in the same room down the road. It will be virtually impossible to match the old with the new granite countertops. You can come close, but they’ll never match exactly. 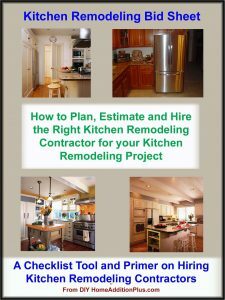 So when deciding on going with granite countertops, make sure you spend the money up front to do the entire kitchen or room with granite at one time. The only realistic way to shop for granite countertops is to visit stores that sell it and to select the color of stone you prefer. You simply cannot order it from a catalogue, as the colors will change with each new supply of stone brought into the store.